Whether you’re sailing to one of the local islands on a catamaran or going more luxurious and taking off on a cruise, the fact remains that if you come to Australia, you’re going to have multiple chances to get your feet wet. Right off the coast of Townsville lies a great place to quickly get away from it all: Beautiful and sunny Magnetic Island. With fast cat service only taking around 20 minutes from the Townsville pier, Magnetic Island is an easy way to get your fill of sandy beaches and water activities. Boasting some of the most sunshine hours in Queensland (320 days of sunshine a year) you’re almost guaranteed a good day by the beach. With over 2500 local residents, a sizable untouched National Park and enough holiday resorts to ensure a fun holiday, Magnetic Island can be a great getaway. Besides for miles of beaches, clear ocean water and an abundance of outdoor and water activities from snorkeling to skydiving, there’s also plenty of restaurants, shops and nightlife. Not only is Fraser Island the largest sand island in the world, it’s also a great place to visit. Whether you’re going there as part of a tour or arriving via ferry with your own 4×4, Fraser Island is one of the best places in the world to get in touch with nature. With hundreds of kilometers of loose sand paths and the only official beach highway/airplane runaway in Australia, Fraser Island is a four wheel driving paradise. Not only can you barrel over Seventy-Mile Beach at 80 km/h but with over 100 fresh water lakes, sand dunes over 200 meters tall and an actual rainforest with giant trees in the center Fraser Island is sure to impress. Besides for amazing sand, Fraser Island has the Indian Head lookout with spectacular overhead views of whales, dolphins, turtles and sharks depending on the season. It also has the Champagne Pools. The natural jacuzzi action of waves crashing into these rock pools make for a fun time. You can also float down the shallow, yet fast moving, water of Eli Creek or do some world class beach fishing right off Seventy-Mile Beach. 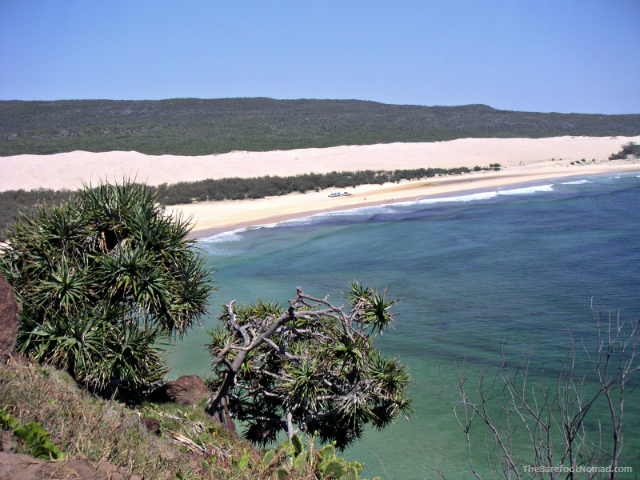 If you can imagine miles of gorgeous beaches, camping out under the stars only a few feet from the crashing surf with your only neighbor the occasional dingo then Fraser Island is a must see island. You can get there via ferry from Hervey Bay or sign on and take a tour. Situated in the white sand wonder of the Whitsundays, Daydream Island isn’t for everyone. That is, unless everyone loves some of the nicest white sand beaches and crystal blue waters in the world. The Whitsundays have made so many top ten beach destination lists over the years that you can be guaranteed to be impressed no matter where you’re from. 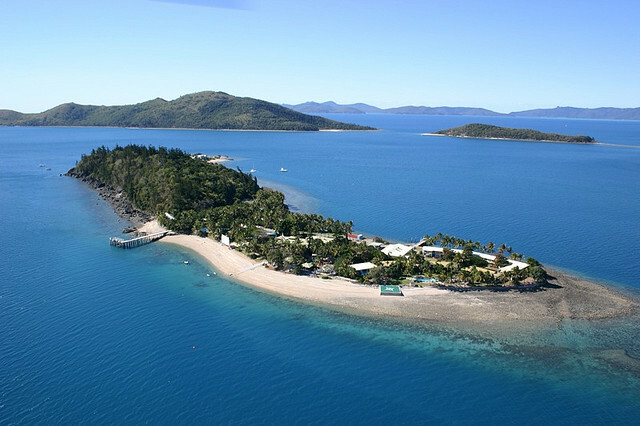 Daydream Island is one of the seven that forms the Molle Group which in turn help make up the Whitsunday Islands. It’s not large by any measure, however don’t let its small size fool you. There’s plenty to do on this white lined island. Long a favorite of sea kayakers and ocean frolickers, it even has a rather unique outdoor aquarium. Only a few minutes boat ride from Arlie Beach, the two resorts on Daydream Island cater to both day trippers and overnight guests alike. The island has also become a wedding ceremony mecca. Who wouldn’t want to get married in paradise? If you’re looking to get away from the water for a bit, Kangaroo Island might be just the place to go. 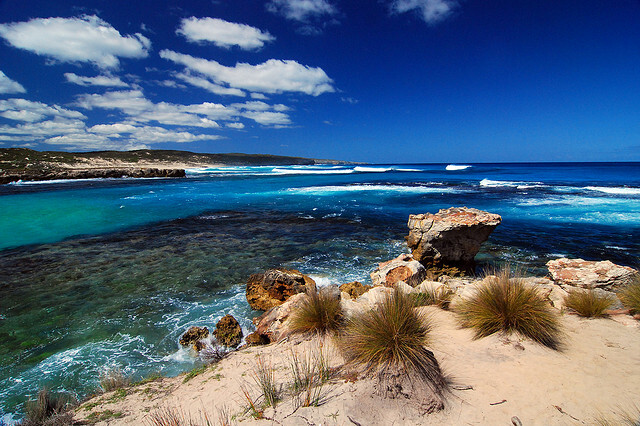 About 30 minutes by plane south of Adelaide in South Australia, Kangaroo Island is a nature lover’s dream. Separated from the mainland over 9000 years ago, it’s unspoiled natural beauty is hard to resist. As the locals say, the Galapagos having nothing on them. Despite being the third largest island in Australia, over half of Kangaroo Island is still covered in full natural vegetation and nearly 1/3 of the island is protected. 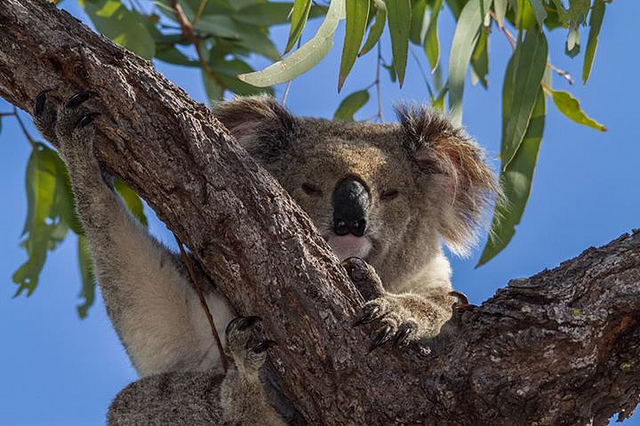 From seals lounging on the beaches (all 480 kilometres of them) and Little Penguin colonies along its coastline to the vast array of kangaroos, wallabies, koalas, echidnas and goannas seemingly covering the countryside this island begs discovery. With four town centres and a major sealed road around the exterior of the island, you can stay in town or camp along some of the pristine shores. With a ferry service running from Cape Jervis (just south of Adelaide) and landing in Penneshaw, you can even drive your own vehicle on Kangaroo Island. If you want to see some nice flora and fauna and Kangaroo Island is a little too far south for you, Hinchinbrook Island, situated halfway between Townsville and Cairns has you covered. It’s Australia’s largest National Park island and is a nature lovers paradise. 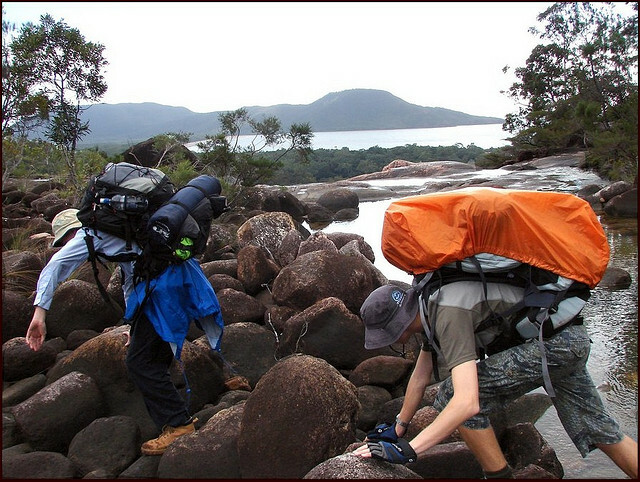 With dozens of trails, none is more famous than the 32 kilometre Hinchinbrook Island Thorsborne Trail. Most hikers take 3 or 4 days to walk the complete track and since there are really no facilities along the trail, everything must be carried in. The only real permanent presence on the island is the Hinchinbrook Island Resort at Cape Richards. This environmentally friendly resort blends in seamlessly with the gorgeous natural rainforest surroundings of the island. After a day of hiking through mangrove forests, dodging saltwater crocodiles, climbing ridges, spotting one of the 60+ species of birds and bathing on palm-fringed beaches make sure you stop off and enjoy a meal at the only restaurant on the entire island, the Hinchinbrook Island Wilderness Lodge Restaurant. No list of great Australian Islands would be complete if it didn’t include Tasmania. Considering its size, it would be hard to overlook. The only island state in Australia, it has a population of over half a million people and is roughly the same size as Ireland. Located south of Australia on the other side of the Bass Strait, it’s not as warm and dry as the rest of Australia however don’t let that stop you from checking it out. There are some stunning beaches on the East Coast (voted some of the nicest beaches in the world) and if you crave civilization then you can check out the capital of Tasmania, Hobart. Hobart has the distinction of being the second oldest city in Australia and has tons of Georgian and Victorian architecture from the early 1800’s. The buildings around the river area are especially nice. If you’re craving seafood, Tasmania has great restaurants to spare. If you’re craving chocolate, wine or beer they have that also. 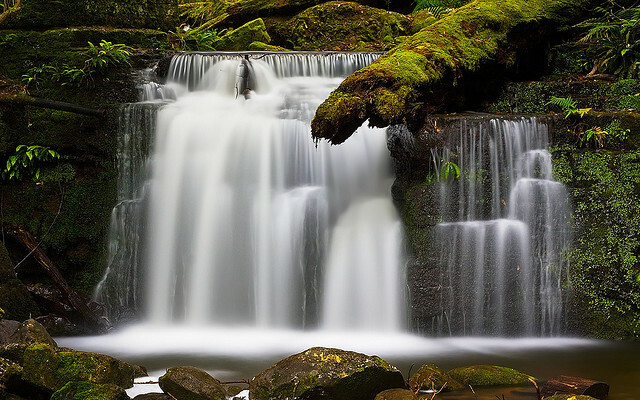 With a plethora of things to see and do all around the island from lazing on the beaches to searching out endangered Tasmanian Devils, Tasmania is like a world onto itself. If you haven’t checked out Tasmania then you’re definitely missing out on a unique side of Australia. You can fly to Tasmania from any major airport in Australia and if you want to drive there are two ferries daily leaving from Melbourne. While I have been to most of these islands, I do not know Hinchinbrook Island which looks great! I would love to visit it on my next trip to North Tropical Queensland. 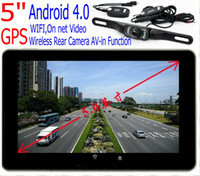 Thanks for compiling this great list of places. We just visited Queensland a few weeks ago and spent a day on Lady Elliot Island. What a great time! Beautiful diving on the Great Barrier Reef.